The four women in the UK post-punk band Savages have been blessed with a great deal of good fortune — thanks to a well-oiled PR machine and the right constellation of music industry interest. 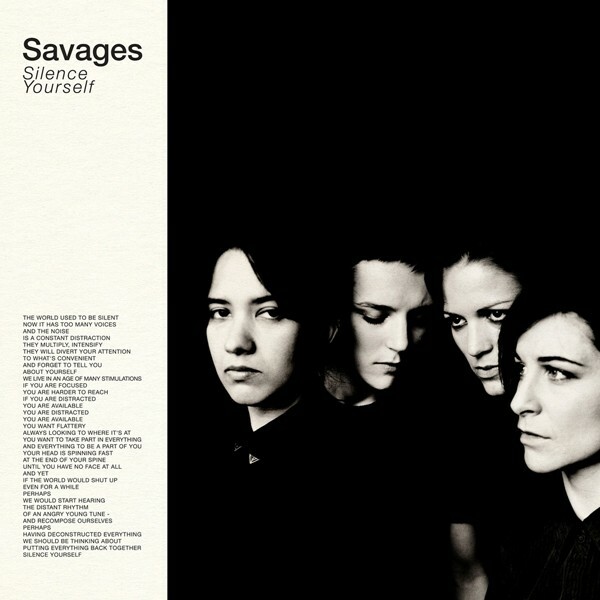 But when you listen to the band's debut album, Silence Yourself, as you absolutely must, briefly forget the hype behind it (including the fact that Savages played a slew of big festivals last year based on the strength of two songs alone). The dark, dirty, and blissful Silence Yourself is a godsend for anyone who has ever loved Siouxsie and the Banshees, Joy Division, Bauhaus — hell, even Fugazi — and their fellow outsider kin. The cheeky guitar riff that kicks off the raucous opener "Shut Up" defies the typical post-punk seriousness — but the churning fuzziness, guttural bass line, and frontwoman Jehnny Beth's theatrically earnest vibrato (which may give you actual goosebumps) all lend the track just enough bleakness. The excellent "She Will" begins soberly, but by the end, the torrential guitar shrieking, demonic percussion, and Beth's wailing engulf any semblance of sanity. "No Face" and "Hit Me" come closest to being straight-up, big-muscled punk songs, but even when Savages shows restraint, it manages to be gloriously loud (see also:"Waiting for a Sign" or the bafflingly idiosyncratic closer "Marshal Dear").